Hauksson, E., Guarino, A. Hutton, K., Given, D., Jones, L.
Renewed seismic activity in the Brawley Seismic Zone began late on 28 August 2005 but reached a sustained higher level of activity, announced by back-to-back M4.6 and M4.5 events at 3:47 and 3:50 p.m. (local time; PDT [GMT-8]) on 31 August 2005. The largest event so far has been a M5.1 quake, on Thursday, September 1, 2005 at 6:27:19 PM (PDT). The activity is reminiscent of similar swarms that occurred in the Brawley Seismic Zone throughout the 1970’s and 1980’s, during which time the zone was among the most active areas in all of California. 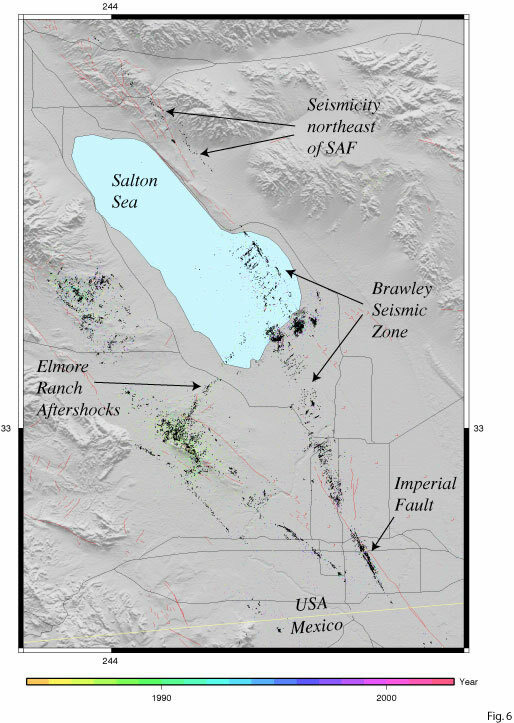 The Brawley Seismic Zone is a north-striking zone of northwest and northeast-striking faults that extends from the southern end of the San Andreas fault to the northern end of the Imperial fault. It is often considered a remnant spreading center in the transition from the Gulf of California mid-ocean ridge to the San Andreas transform fault. Historically, activity includes both northeast-oriented cross-faults that typically involve left-lateral faulting, such as is currently occurring, and activity on northerly to northwesterly-oriented strands of the zone. The largest events to have occurred on the cross-faults were the Elmore Ranch event in 1987, which is considered to have triggered the Superstition Hills event less than 12 hours later, and the Westmorland event in 1981. Although Brawley Seismic Zone activity is clearly proximal to the southern San Andreas fault, the San Jacinto fault zone, and the Imperial fault, the current activity is remaining more than 10 km distant from any of these major faults. The pattern of Brawley swarms of the 1970’s was a large number of very small earthquakes (sometimes exceeding 10,000 events) with up to a dozen moderate events of magnitude 4 or so, but no clear mainshock larger than the other events. The 1970’s swarms would be highly active for a few days and then taper off over the next week or two. 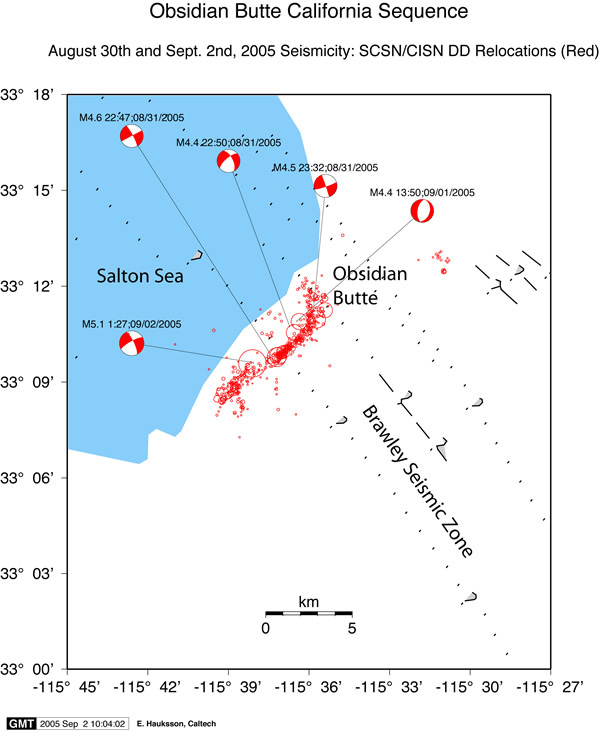 In 1999 and 2001, two other smaller swarms occurred on northeast-striking faults in the Salton Sea. Compared to those two sequences, this weeks swarm has significantly more events, but also is located significantly farther away from the San Andreas fault.